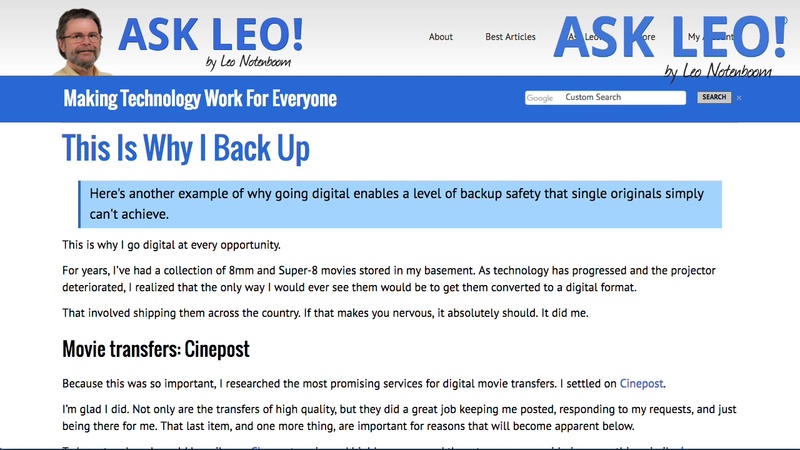 This Is Why I Back Up - Ask Leo! Here's another example of why going digital enables a level of backup safety that single originals simply can't achieve. 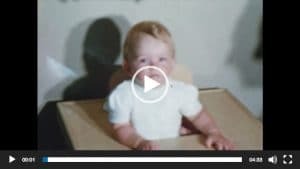 I had multiple 8mm and Super-8 movies transferred to digital form. One package was lost on return. The transfer company kept a digital backup, which I was able to download instead. Digital forms are much easier to back up and keep safe. The “lost” originals were recovered, due to the kindness of a stranger. Because this was so important, I researched the most promising services for digital movie transfers. I settled on Cinepost. I’m glad I did. Not only are the transfers of high quality, but they did a great job keeping me posted, responding to my requests, and just being there for me. That last item, and one more thing, are important for reasons that will become apparent below. I ended up sending a selection of my movies in three waves, though it was originally intended to be only two. First, I sent in three movies — two older 8mm films of me as a small child and one Super-8 — to test the process. You can see the results of the 8mm transfer on my personal blog post, Little Leo. These were the most important films to me to preserve in some fashion. While it was a little risky to send these in as part of a “trial run”, the results exceeded my expectations. The original films were returned, along with the digital copies on a USB hard drive. 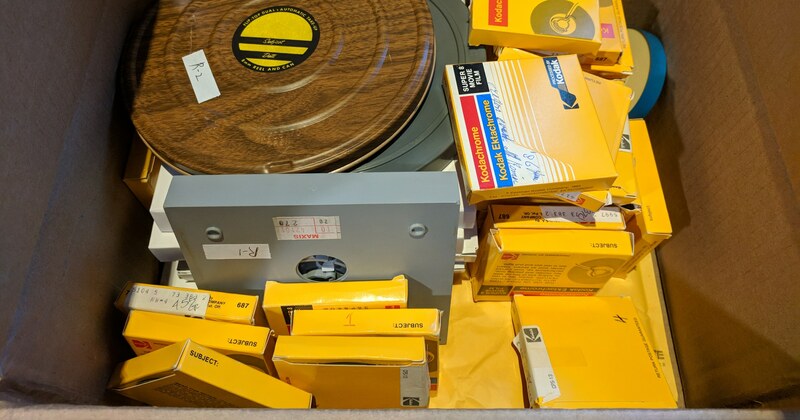 Once I saw the results, I went all in, boxed up the remaining 26 reels (2,000 feet) of Super-8 film, and sent it off for conversion. This time, the hard disk was returned separately, so I could review the results before the originals made their way back to me, in case anything needed to be redone. The results were once again perfect. Of course, as I was reviewing the results of the larger batch of movies, I discovered I’d overlooked four more. I sent those in and told the folks at Cinepost they could just send everything back once these final four had been converted. That’s when thing got interesting. While traveling, I received email notification from the shipping company2 that the package, which required a signature, had been delivered to my home. My wife hadn’t signed for anything and knew nothing about it. When I returned home, the package was nowhere to be seen. At this point, I had the conversions of all but those last four films. They were lost, and since they’d been shipped back together, both their digital and original forms were lost. Let me say that again: they were lost. But then I remembered something the folks at Cinepost had mentioned. The digital conversions remain on their equipment for some period of time after being returned to the customer. Put another way, they kept a backup. The movies were not “in only one place”, they were in two: the lost package, and at least one machine across the country from me at Cinepost. We made arrangements to begin transferring those files via the internet. They were large, so they took some time to upload, but they existed. These movies were films I didn’t even realize existed. 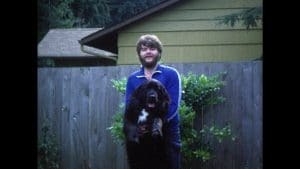 They were films of me and our first dog, a Newfoundland named Elsie, taken not long after my wife and I were married. As you can imagine, they were incredibly touching for me to see. All of that happened automatically, of course, within a few days of the digital copies arriving here. Even if I never got my originals back, I had the digital copies, and they were backed up. I have the digital copies. I can, and do, back them up to my heart’s content. To be completely honest, I’m not sure if the originals will ever see the light of day again. There’s no need. But this is why I love digital information and digital conversion (or copying, if you like) of analog or pre-digital media: it opens so many possibilities. Not only can I share what I have (as in my post), but I can back it up. I’m no longer reliant on one and only one copy of the movies in a format that has a finite lifespan and can be difficult to access. What are you at risk of losing because you have only a single copy? What are you at risk of losing because it’s the only copy, and the mere act of viewing it causes it wear and quite possibly literally tear? What else don’t you have backed up? I’d begun the lost-package tracking process with Cinepost and the delivery service to see if we could track down what happened to the originals. Two days ago, there was a knock at my door. A stranger, holding a package. The package had inexplicably been delivered to an address three miles away. Coincidentally, this person had also been out of town, and his neighbor had taken delivery and signed for the package without looking at it closely. Once the package had been opened, of course, it was clear it had been misdelivered. He took the time to deliver it to the correct address. Sadly, being so surprised, I didn’t think to get his name — but I’m very, very grateful. How Do I Back Up My Computer? - Backing up your computer is critical to avoiding data loss. I'll look at what it means and give a suggestion for average users. 1: As I write this, this is not a compensated recommendation. I get nothing for mentioning them. I’m simply a happy customer. 2: Intentionally not naming, but you’d recognize ’em. « Previous post: How Do I Keep My Kids Safe from Internet Garbage? This won’t add to the discussion so I won’t be upset when you delete it but I wanted to let you now I’m glad you started videoing these. Nice to put a face to the knowledge. For me it was the bulb burning out on my dad’s 8 mm projector that got me going on this. I had to get digital copies. I opted to do it myself in the dark basement. Fortunately, my father-in-law also had an 8 mm projector. I used my HD video camera to record the film shown on the screen. And the camera’s mic picked up the whine of the projector and the clickety-clack of the sprockets. I think Leo’s quality is better than I was able to achieve, but I’m pleased with the results. They don’t look too bad, considering the original media. Note, that if you do try this yourself, I got better results by turning off the automatic camera adjustments and set a fixed focal length, etc. I put the digital copies onto DVDs and gave them to my dad (they are his films after all). I have also copied them to an external hard drive. So I’ve got copies in at least 3 places (if you don’t count the clips on Facebook that my dad shared with my cousins). I was under the (mistaken) impression that MS provided some sort of backup system for OneDrive. Based on these 2 cases, apparently that is a bad assumption. Very surprising too. It is in no way surprising, and I’ve counselled on this repeatedly: if it’s only in one place, it’s not backed up, and cloud storage (ANY cloud storage) is one place. The backups OneDrive and Dropbox and Box and Google Drive and all the others have are for their use, for example if there are system failures. They’re not intended for people who lose their files in some other way. You and only you are responsible for backing up your files, and for maintaining your account security. Having OneDrive or Dropbox syncing your files isn’t really a backup in the true sense because any files deleted on one will delete them on the other. They do serve as great short-term backups in-between daily incremental or differential backups, though.